Unique folding grocery totes. Really impressed with this company as a whole and plan on doing more business with you guys in the future. Love the folding attribute this bag possesses. Eco-friendly and unique compared to others. I highly recommend purchasing this bag or taking a look at Custom Earth Promos products. Great bag to use as a promotional gift. We ordered every color you guys had available and the logo you designed for us came out better than anticipated. Going to re-order this bag for sure. Great fit for my business. Eco-friendly bag that helped me promote my business. For what it is you cant beat it!!! I would reorder this bag, we had a very good first experience with custom earth promos. We ordered two colors royal blue and yellow, they came out great. This is a nice bag to use as a gift. Your gift recipients will love this bag. I love how this bag folds up, we give this bag to our students it makes for great storage in all of there cubby's. I like the style of this polyester bag, there website does a good job of explaining what the bag does when it comes to folding and all the product details. The pictures are very accurate too to the actual product. Good website that doesnt lie. I have to admit this was better then I expected. It was a great experience using custom earth promos. All new residents receive this bag a complimentary house gift along with some other items that we get from custom earth promos and other companies. To say this bag is cheap is wrong, it is very affordable but it is quality made and will not make your company look bad. Very quick processing of my order and received in a timely manner. Great service and good product. I recommend this bag I ordered it three times already. I was recommend to use custom earth promos from a friend. He uses them for a multitude of bags. I just needed them for a large gathering that I am hosting. I ordered this bag as the gift bag, I worked with them and designed a custom graphic to print on my gift bags. The finished product came out great, I would now recommend them to a friend in need as well. They deliver bags all over the globe for me an my organization. I have literally split orders of the same bag to deliver to five different locations. They really work with you if you have logistic challenges. The sample I received seamed to be in good quality I was excited about receiving our order, when we did it receive the bags it was in the time frame supplied and the bags where of good quality just like the sample. I was able to personalize this bag to suit my needs, it was a easy process and they have a great staff to navigate you through this process. Reusable bags are the future of shopping, plastic bags are very harmful and are a tremendous wasteful cost for your business to incur. I suggest using custom earth promos for reusable bags. I have never had a problem with them. Amazing oversight over my order, every time I called they had an update for me. I need this type of attention when I order 10K worth of bags. I will definitely be using this company again in my opinion they are the best in the reusable bag game. Hottest item at our bag party, the orders already sold out for next week. Great work from custom earth promos, I will only order from them. The print on bag came out better then I thought, I would reuse this company just bases on there print quality. 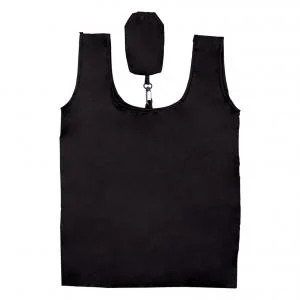 Awesome bag, affordable and I get them quick I order it all the time for our showcases. 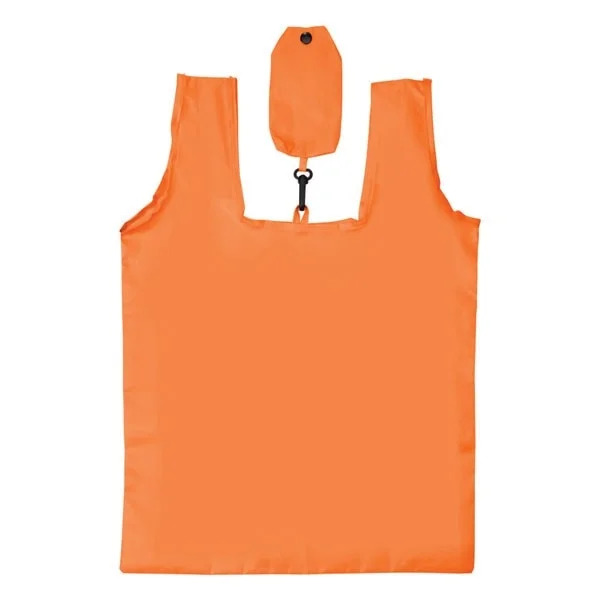 This is a nice sized bag the polyester is durable and cleanable. 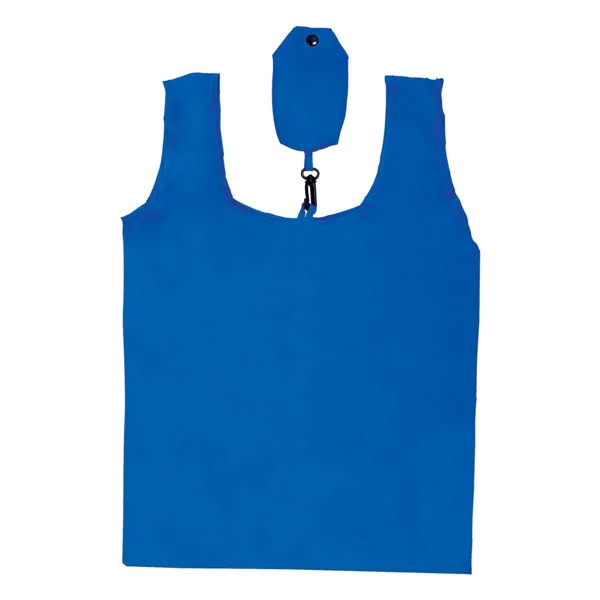 Our Polyester Folding Grocery Tote is the perfect promotional item for your company! The eco-friendly design and 8" H x 9" W imprint area gives your business the upper hand when it comes to attracting a new potential market! Your clients can use the bag over and over, for trips to the grocery store, to the gym, or a day out and about. Make sure to include your brand logo in the design process and pick from one of the 7 color options: Black, Lime Green, Navy Blue, Orange, Purple, Red & Reflex Blue. The variety in value in our Polyester Folding Grocery Totes is expansive, ranging from grocery trips to being used as a great promo tool, to even helping save the environment. Custom Earth Promos makes sure to give our clients the best product for their money, and using the biodegradable tote can help your brand reach a new market. The bags are easy to carry, modern, and built for everyday use. Your business will be in the spotlight when it comes to your customers' favorite brand! This bag is made from reusable 190 T polyester and folds well into its accompanied pouch, perfect for on-the-go storage! 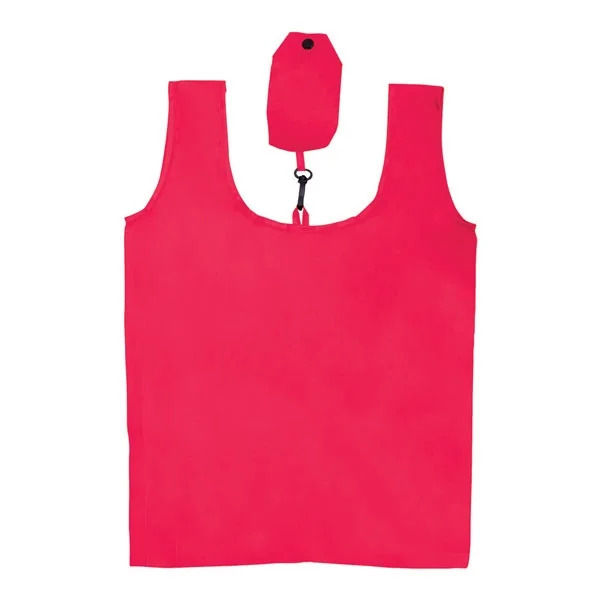 The durable material allows you and your customer to get the best use out of the bag. 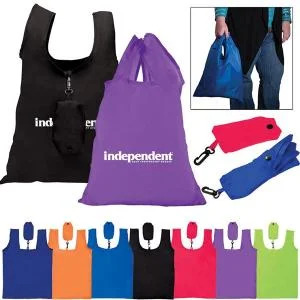 You can reuse extensively and give out the bags at all of your business conventions. Your clients will be able to use them for daily chores and errands, like going shopping or a day at the park. The fabric is perfect for a casual outing, folding up for use in another day. You'll be able to reach a new, eco-friendly market by promoting a green message along with your individual company logo. Make the most of our color and design options when creating your perfect promotional product! Make sure to take advantage of our flexible overseas customizing options to create the perfect promotional tote for your brand! At Custom Earth Promos we value great customer service, an easy to work with process, and unproblematic interactions with our overseas manufacturer. 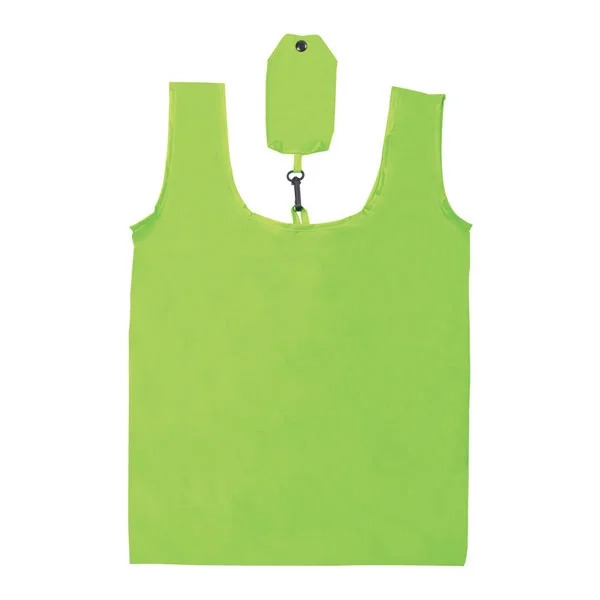 Expand on the color and imprint decisions we have to get everything you want in your Polyester Folding Grocery Tote!